Socio-economic change: polarisation between high and low income groups? Multicultural Brussels: inclusion or conflict? Towards a repressive welfare state? Integration thanks to the government? Institutional changes as politics of scale for the poor? Increasing the size of the region? 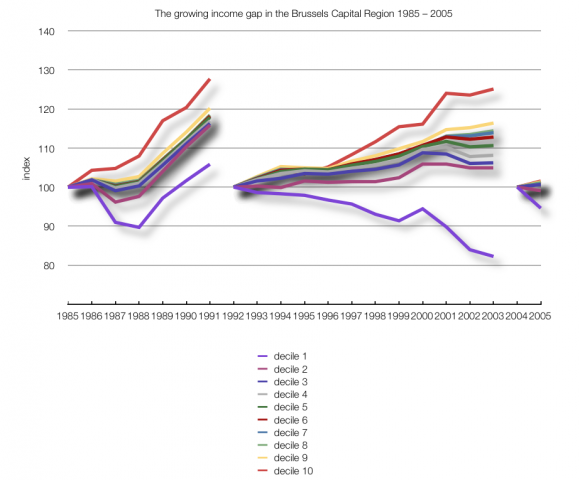 1The Brussels Capital Region has experienced a significant period of economic growth over the past few decades. The service sector has been particularly responsible for this economic performance, largely comprising the European, federal and regional administrations. However, overseas investments in the service sector have also been an important factor. In broad terms, Brussels has 2 000 foreign companies, which account for 234 000 jobs and 40% of the Brussels GDP. Over the past few years, people in the Halle-Vilvoorde and Nijvel arrondissements have benefitted more from the Brussels-effect than those actually in Brussels. The economic growth in Brussels between 1995 and 2005 measured 2.2% (higher than in both Flanders and Wallonia); in Vilvoorde it was 2.9% and in Nijvel it even reached 4%. 2This economic success can also be seen in a population growth that stems from immigration, making Brussels the most global city in Belgium, in terms of its population. Around 30% of the population have a different nationality than the Belgian nationality (and a further 20% of Brussels residents have swapped their original nationality for the Belgian nationality). Just as in the majority of cities in Flanders, Brussels immigration is a relatively recent phenomenon and the foreign population has grown strongly since the 1960s. The foreigners in Brussels are mainly the result of various waves of post-war immigration. It is estimated that there are currently around 170 nationalities within the Brussels area. 3Each expansion of the EU sees highly-skilled people from the new countries arriving to join the ranks of EU officials and bringing a whole community in their wake. The larger Europe becomes, the greater the attraction of the city is for important economic actors, whether leaders and executives of multinational companies, or specialised services for companies that operate in the world economy and are based in Brussels in order to manage their European activities. 4The other side of the social spectrum used to be dominated by the migrant workers of the 1960s and 1970s, who in turn replaced low-skilled Belgian workers. Many of these migrants have not had the chance to help their children climb the social ladder, as the crisis of the second half of the 1970s and the 1980s prevented them from doing so. However, since the 1990s they have been joined by a new wave of migrants who this time come from all over the world and who stay here illegally, temporarily or permanently and who often seek an income through informal activities. They often end up in activity sectors where common strategies for keeping prices low, such as mechanisation or delocalisation to low-wage countries are not possible and where the solution is found in the search for informal and low-paid labour (e.g. in the construction, catering, cleaning and transport sectors, etc.). These sectors also experienced a boom through the growth of the Brussels economy (for instance, in the construction and maintenance of offices, the growth of the catering sector through the increase in tourism and wealthy knowledge workers, etc.). 5Despite the large welfare production and international attractiveness of Brussels, the city has also experienced serious socio-economic problems. The unemployment level, which has hovered around the 20% mark over the past few years, is extremely high. The average family income decreased from 160% of the national average in 1963 to only 85% in 2005. Such changes conceal distinct internal contrasts. While one in four residents of Brussels lives under the poverty line, Brussels is also home to a growing, well-paid transnational elite estimated to account for between 10% and 15% of the population. The gap between these different income groups is growing and the absolute purchasing power of the poorest is decreasing. This is shown in the graph below, which indicates the division of the taxable incomes in constant prices per decile. 6There is a growing disparity between the highest and the lowest incomes since the end of the 1980s. The gap remained stable during the better economic spell between 1988 and 1991, but continued to grow again from 1992 onwards (due to changes in the tax law, there are gaps in the series so new index years have had to be taken). The purchasing power of the lowest 10% decreased at the end of the 1980s and has continued to do so since 1992. Tax fraud and the informal economy are perhaps the most important factors in creating the disparity between the figures and the actual situation; however the historical trends that the graph shows are nevertheless alarming. 7The internal socio-spatial polarisation in the Brussels city region is greater than elsewhere in Belgium: the Brussels city region has the municipality with the lowest average taxable income per tax return (Sint-Joost-ten-Node) and the municipality that was the richest for several years and still now ranks amongst the richest (Lasne). In 1993, the average taxable income per taxpayer for Sint-Joost was only 48.4% that of Lasne. In 2005, it dropped to 42.6%. The difference between these two municipalities, one in the city centre, the other in the periphery, is not just coincidental. Urban growth has mainly taken place in the suburban belt over the past 50 years and has been socially selective. The new houses in the periphery (largely outside the Brussels Capital Region) were erected for the middle and higher classes, enabling them to leave the city centre. The lower income groups were left behind in the city centre. To a large extent, the various immigration waves also followed this pattern: rich immigrants settled in the periphery, mainly in the east; poorer migrants ended up in the westerly working-class districts, the “poor crescent” of Brussels. 8The spatial distribution of the total taxable income per municipality in the city region shows the result of this process. Due to the selective character of suburbanisation, the population decrease and the economic crisis, the global incomes of the total population in the central municipalities of the Brussels Capital Region have almost seen no increase over the past 30 years, whilst the municipalities in the periphery of the city region (mainly in the south-east) have been able to triple this wealth (the policy consequences of this will be examined further on). 9This pattern has recently been disturbed by gentrification. New types of households, often young double-earners or young transnational knowledge workers, choose to settle in centrally-located neighbourhoods with attractive housing and an attractive public area. In certain neighbourhoods, this has led to a new social mix, whilst in others this has increased the elitist character of the neighbourhood. In all cases, gentrification and the population growth of the Region compound the price increases on the housing market and in the local retail outlets, making it increasingly difficult for the lowest income groups to find decent housing, which results in slumlords and homelessness. 10The existing segregation also mirrors the spatially differentiated access to the employment market. The Brussels economy is strongly dependent on the contribution of mainly highly-skilled external workers from Flanders (230 000 in 2006) and Wallonia (126 000). The Brussels residents often do not possess the required qualifications and command of languages for the jobs that Brussels and the surrounding area create as a capital city and European centre (98% of unemployed people in Brussels are monolingual – mostly French-speaking – and for that reason alone, they are refused jobs in the city’s demanding international economy or in the surrounding Dutch-speaking areas). A job in the periphery is also often very difficult to reach from the city centre using public transport. 11The jobs that remain offer disproportionate prospects on insecure and low incomes. Temporary work increased by almost 200% in the Brussels Capital Region from 4.3% of paid work in 1992 to 12.6% in 2006, whilst this share only increased by 77% for the country over the same period. Temporary work is highly sensitive to economic fluctuations and therefore offers little security of income. 12The fast diversification of the Brussels population altered the character of the city considerably. The foreign population in Brussels comes from all over and comprises ((grand) children of) earlier guest workers, Euro officials, multinational expats, refugees and illegal immigrants; some of whom are extremely rich and some extremely poor. This diversity leads to problems and conflicts including mutual racism and discrimination, riots and other expressions of abhorrence towards “the other”; origin and colour also seem to have a significant influence on the opportunities for climbing the social ladder. 13The inclusion of all these different groups in a common urban project is no simple challenge for the future. The one-sided vision on the “integration” of guest workers in and by a Belgian francophone middle-class-determined society from the 1970s to the 1990s is no longer appropriate. Brussels is evolving towards a multifaceted diversity where adjusting to the multicultural reality is becoming a more realistic perspective than adapting to a monocultural host city. At the same time, the noncommittal way in which integration is being dealt with in Brussels is also dangerous. Having no duty to integrate is actually the same as not having compulsory education in the sense that the weakest groups are deprived of chances to work their way up in society. Furthermore, there is also the threat of the spectre of communitarisation: in all this diversity, how do you maintain a shared “imagined community” that makes mutual solidarity possible and prevents groups from voluntarily shutting themselves off from repression or calling for repression against others? 14After the Second World War, Belgium developed an extensive welfare state with a social security system that, up to the end of the 1970s, had the ambition of eradicating poverty in society. Today, this ambition is needed more than ever as Brussels has so far not succeeded in guaranteeing decent housing for everyone. The pressure on the housing market mainly affects the lower realms of society and requires large-scale investments in the social rented sector; however, social housing policy continues to lag behind. 15Brussels education policy is also no longer able to create more social equality. Both Flemish and French-speaking education score very badly in international comparisons when it comes to offering equal opportunities (PISA comparison) and therefore form an important factor in reproducing inequalities in Brussels society. This is damaging for the future, especially in an immigration city such as Brussels, where thousands of young newcomers arrive each year requiring extra efforts to be made. 16Where the efforts in Brussels for combating social inequalities are thin on the ground, it seems that investments in repressing weaker groups increase. The homeless in the consumer-based city centre are deported to Neder-over-Heembeek and illegal immigrants are not even safe from the Department of Federal Immigration on public transport. The seemingly legitimate demand for public order from prosperous groups that are returning to the city centre is increasingly being aimed at the presence and the objectionable behaviour of certain groups (allochtonous youngsters, the homeless and street prostitutes). 17The main problem therefore consists in significantly decreasing the social inequalities to a level where each inhabitant of the city has the guarantee of being able to live in a decent way. This is a question of social justice that the city should be able to guarantee to all its inhabitants, in the first instance comprising decent affordable housing, access to an income that provides decent food, clothing and household goods (or direct access to these means of existence), access to decent healthcare, education, culture and mobility. 18These living conditions are primarily assured in our capitalistic society through access to the employment market and remuneration for the work done that is high enough to provide the required income security. However, even in one of the most competitive regions of the world economy, the employment market offers no guarantee for improving the fate of the poorest population, nor does it guarantee quick integration and the upward social mobility of newcomers to the urban Community. 19Other paths do exist for combatting social inequality. Direct mutual solidarity and reciprocal help between people via social networks is a matter of life and death for some in our society. In order to make this reciprocity possible, people try to live in the vicinity of their family and ethnic groups remain living together. It is no coincidence that this has been the reason why all sorts of initiatives have also focussed on the structure of society and social cohesion. However, social networks do not bring universal happiness. Mutual solidarity is conditional and limited to members of the network; people who are in need of solidarity within their network do not always have much room for negotiation in exacting this solidarity. Furthermore, social networks are often intrinsically linked with identitarian processes which often make them socially selective, which in turn excludes the weakest groups from the strongest networks. 20The government’s redistribution policy, particularly in the construction of the welfare state in the previous century, is a more extensive alternative. By levying taxes and collecting social security contributions, the government centralises part of the produced wealth and distributes it once again according to politically-determined rules. The most important instruments in this are the (increasingly less) progressive tax rates, the social security that provides supplementary or substitute incomes and access in kind (mainly for healthcare, but also for housing in some countries) on the basis of the collected contributions from employees and employers and/or taxes. The government is also able to act in a regulatory way on the employment market in an attempt to steer the division of incomes at the source: possible ways include monitoring discrimination, stimulating jobs for groups that have little chance on the market (e.g. the low-skilled), but also regulating working time, the level of the wages and working conditions. Finally, the government also takes care of a number of collective consumer goods and services: information, communication and transport resources, trade, schooling and training, culture, recreational infrastructure, safety and healthcare. 21The government’s redistribution task is organised on different levels. The debate about which task is best handled at which level is both complex and age-old, and is also often embroiled in communautaire issues in Belgium. The question here is which role the Brussels governments can play in this jumble. 22The regulation of the employment market is under much pressure: cities and nation-states are played off against each other as competitors and are left with little room to put forward social needs in employment market policies. Another way could be to extend the European level, because this level still transcends the logic of competition to some extent, but pressure from below is needed for this; from the city, where the tension between competition and solidarity is the most tangible. In order to make Brussels more social, it needs to join together with other cities in unambiguously pleading for a more social Europe. The same issues arise on the level of social security, which has historically been developed on the level of the national state. Regions (not only Flanders) are demanding to have more of an impact on social security so that redistribution flows can be directed into their own competition strategy. With a low employment level of city inhabitants, a large number of commuters and high levels of unemployment, this is not a beneficial path for Brussels to take. Should Brussels not rather plead for this redistribution system to be raised to the European level, making it a core element of social Europe? 23The city is traditionally the locus of collective consumption. However, Brussels is confronted here with a double field of tension. The city’s care hinterland extends beyond the Region’s administrative borders, roughly corresponding to the regional employment basin. However, because the financing of this service is largely done through the Region and the Brussels municipalities, many users (the commuters) contribute less to its financing. External financing (which is not exclusively borne by the commuters) is only for “personal matters” (from the communities) and from specific funds such as Beliris or the Grootstedenbeleid (from the federal government). 24On the other hand, tension surrounds internal redistribution: which Brussels residents benefit from collective consumption? The problem of the Brussels municipalities arises here. There are 19th century working-class districts from the first belt as well as more prosperous districts from the second belt in the majority of the municipalities; there are social housing estates and private residential neighbourhoods. It should be evident that the necessary solidarity is developed on this level and that the municipal policy relating to collective consumption therefore works in a redistributive manner. The problem is more that municipalities have good reasons for taking other paths than that of solidarity. 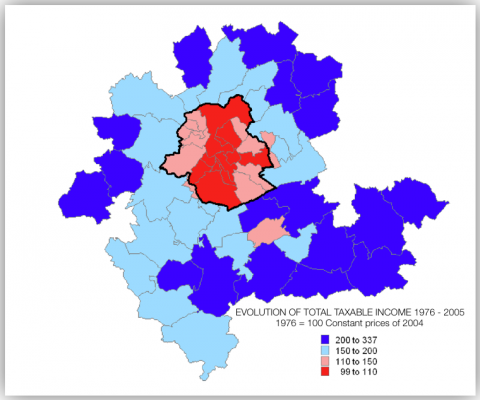 The Brussels municipalities are competitors in fiscal terms and use housing policy and spatial planning to pass on the poorest inhabitants to one another and to attract the richer inhabitants (a sort of spatial Blame Game). By attracting people with high-end jobs and elbowing out people with low-end jobs, an attempt is also being made to increase the value of property. This enables the municipalities to increase their incomes from the supplementary taxes on the income tax and also on the property tax. In this context, urban renewal is usually an operation that provides benefits on both levels. Gentrification in one’s own territory is a desirable evolution, whilst the addition of new social housing is avoided like the plague. The question is therefore one of how the fiscal competition between municipalities can be changed into distributive justice. This would involve poorer municipalities receiving more resources, and also that these resources are actually used in tackling the inequality and not for improving their competitive position. 25The municipalities, the Region, the Brussels hinterland, Belgium and Europe are all involved in the battle against social inequality in the city. It all boils down to allowing these different levels to work together and to prevent competition emerging within and between these different levels. 26As the production of wealth is extensive enough in Brussels, the question is one of how this wealth can be fairly distributed across the population. This redistribution can not be viewed in isolation from the institutional structure of the Belgian state. So what are the institutional paths that can now be taken for achieving fairer redistribution? 27The call for increasing the city region is great as this would mean that the expense of collective consumption could also be carried by the broad shoulders in the periphery. The realisation of an institutional city region is not simple and is a source of political ideological conflicts. This is increasingly hampered in a Belgian context due to the communautarian issues. However, the most important question is whether this will counteract socio-economic polarisation. Even if the resources available to Brussels were to increase, then there is still no guarantee that these increased resources would actually be used to close the social gap in Brussels. An expansion of the city region would also primarily involve an extension of the political power that the rich suburban citizens have over the centre. In terms of spatial planning, mobility, trade and investments, political parties that are also popular within the rich periphery of Brussels, have so far utilised the Brussels resources more in favour of the city users than those who actually live there. Instead of using redistribution, socio-economic tensions are mainly combatted through repression. 28This does not do away with the fact that it is essential to hold the city users partly responsible for the city’s future; firstly by obliging them to contribute to the costs of the collective consumption that they benefit from in the city and to compensate them with a vote in the matters that concern them in the city. In a more structural way, the integration of city users within the urban community demands umbrella institutions within which people can negotiate with each other about the future of the city, from three structural interest positions: the poor and the newcomers who live in the central area of the city, the Brussels middle-class who reside in the better (parts of) the Brussels municipalities and the city users. 29An alternative to the expansion of Brussels is the preservation or even contraction of the Region in order to create a really urban region. This would at least make the poverty visible – and not concealed by averages that ignore the internal differences. Furthermore, poor city residents would be given a say in the institutions that are their mouthpiece, through which they can develop and defend their interests and requirements. Perhaps this would enable redistribution from the Brussels suburbs to the Brussels Region to be enforced; for example through local taxes that are partly paid at the place of work instead of at the place of residence. The same reasoning is also valid for the internal municipal differences. If we were to have around 30 homogeneous clearly-defined municipalities in Brussels, then as well as Sint-Joost-ten-Node, there would be another fifteen that could epitomize and defend the interests of the poor. The central districts and the most vulnerable inhabitants in the Region would be supported on three levels: internally, the political representatives would find it necessary to take account of the population without a vote as this is the largest group; the problems of the central neighbourhoods would be represented more strongly at the level of the region and also on a federal level; new local politicians would build up expertise in defending these interests; finally, because of the (weak) solidarity mechanism between the Brussels municipalities that is built into the Municipalities Fund, the redistribution of resources between rich and poor municipalities would increase. 30In terms of administrative efficiency, the amalgamation of the smallest municipalities could also obviously be considered or a redistribution of powers between municipalities and Region, or even collaboration between municipalities on certain matters via intermunicipalities. Only the first option conflicts with the advantages of more, homogenously defined municipalities in the Region. Increasing the number of Brussels municipalities does not prevent powers or new forms of intermunicipal collaboration from being redrawn. However, it seems important to examine these proposals against the capacity of these institutions to guarantee redistribution at multiple scales. 31Solidarity should not only be organised on the correct scale levels, but it should also have a political and social basis. Presently, Brussels is a divided city that lacks such a basis. Brussels is no longer an ethnically homogenous, bilingual city and the externalisation of a Belgian nation. However, the city is also no longer imprisoned in a homogenous national culture that expects newcomers to integrate before receiving solidarity. This lack of national culture means that Brussels appears as an “open” city to newcomers. Being incorporated in the urban community does not need to mean that one acculturalises or assimilates. Policy needs to adjust to this reality: instead of wanting to continue administering Brussels as a part of French-speaking Belgium or Flanders, the Brussels openness should be exploited and a resolute choice should be made for an international future. 32However, openness also implies possibilities for a way out. Transnationality means that people can also quickly withdraw themselves from solidarity links in one place when they come out better in another place; situational solidarity is becoming less common and is often being substituted by solidarity within transnational networks. The cultural, institutional and socio-spatial structures make it perfectly possible to shut oneself off to the poverty and misery of other groups. How the population of Brussels, in all its diversity, can be encouraged to take part in solidarity and commitment over and beyond group boundaries is an important challenge for the future, where classical recipes of social structure and social cohesion will not be sufficient. 33Solidarity will be essential for safeguarding the future of Brussels. The Brussels translational population is pre-eminently young and therefore forms the future of the city. However, an important number of these young people are also poor, receive insufficient schooling, are not able to find work and live in impoverished conditions. An open city not only has a cultural significance, but also means that everyone receives sufficient chances for personal development and for climbing up the social ladder. Training, employment and housing are therefore the key sectors. 34This means that Brussels politicians need to pay less attention to the quantitative aspects of job creation, and focus more on the quality of the jobs: which jobs do we want in Brussels for Brussels residents? This also calls for deliberate investment in a fundamental quality and affordability of housing and that gentrification, rather than being a threat to the poor inhabitants of the inner city, should be the basis of a redistributive policy on a regional level. The combination of soft gentrification (in which newcomers share the diversity of the city with the existing population) and social housing development in the same neighbourhood offers perspectives for improving access to services including education. This type of social mix is a possible strategy for creating a basis for a balanced spatial distribution of services (collective consumption) and equal access to these services. This would enable the social and ethnic segregation to be tackled in schools. The provision of good schooling and training, where multilingualism is seen as a trump card for an international city, where newcomers are actively taken care of and where equal opportunities are given as much attention as performance, are all essential for guaranteeing the openness of Brussels in the future. Observatorium van gezondheid en Welzijn van Brussel-Hoofdstad http://www.observatbru.be (consulted on: 3 February 2009). VAN CRIEKINGEN M. (2006) “What is happening to Brussels’ inner-city neighbourhoods?”, Brussels Studies No. 1. http://brussels.revues.org (consulted on: 3 February 2009). KESTELOOT C., MISTIAEN P. & DECROLY J.M. (1998) “De ruimtelijke dimensie van de armoede in Brussel: indicatoren, oorzaken en buurtgebonden bestrijdingsstrategieen”, in VRANKEN J., VANHERCKE B. & CARTON L., mmv. VAN MENXEL G. eds., 20 jaar OCMW, naar een actualisering van het maatschappijproject, Acco Leuven, p. 125‑155. Aussi en français : KESTELOOT C., MISTIAEN P. & DECROLY J.M. (1998) “La dimension spatiale de la pauvreté à Bruxelles: indicateurs, causes et stratégies locales de lutte contre la pauvreté”, in VRANKEN J., VANHERCKE B. & CARTON L., mmv. VAN MENXEL G. eds., 20 ans CPAS, vers une actualisation du projet de société, Acco Leuven, p. 123‑153. Maarten Loopmans has a PhD in Geography and lectures on the STeR*-Stedenbouw en Ruimtelijke Planning course at Erasmus University College Brussels.